We can never know about the days to come, but we think about them anyway…. I come from a long tradition of sewing. My grandmother was a talented seamstress, starting when she was very young, designing and constructing ensembles that were interesting in 1915, but could even pass muster in 1969, as well as today. Gram made all of my mother’s clothes – including her wedding gown – and continued on to make outfits for us, her lucky grandchildren. She was so artistic in design, and adept with a needle and thread, that Mom was recognized as a fashion plate by a buyer for one of the big stores of the era. Grammie and Mom would window-shop on Fifth Avenue, gazing at the well-turned-out mannequins of Bergdorf’s, Lord & Taylor, and Saks, while Mom mused aloud. When they arrived home, Gram would get busy with newspaper and chalk, drafting her own patterns. Then they’d go shopping again, for just the right fabric, buttons, and trims, and the old Singer would become a fixture in the dining room until one day…. Voilà! 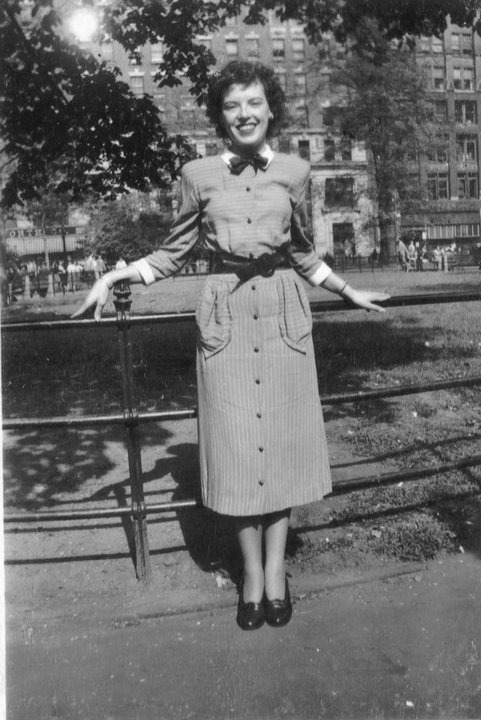 Mom would appear in the park on her lunch break, looking like a movie star in her unique and expertly tailored new duds. Even while Gram was making clothes for the next generation, Mom took up the needle and sewed up a storm herself. 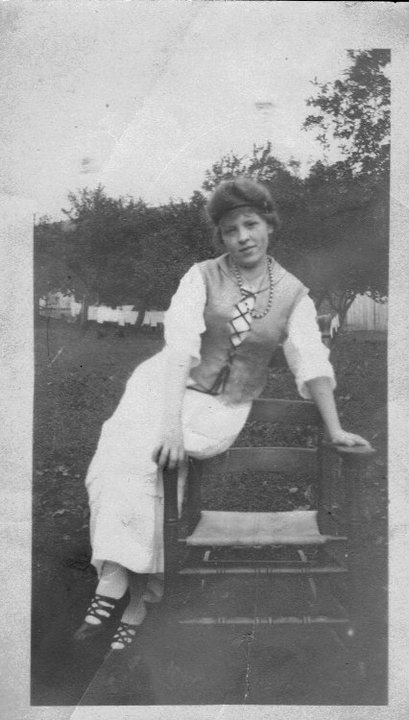 Although no one was quite as prolific with a camera as selfie-obsessed people are today, I’m sure that somewhere in the trove of family photos are many showing us garbed in Mom’s handiwork – dresses, shirts, shorts, even coats (and plenty of knitted things, too!). At some point, I realized that I, too, could fashion made-to-order clothing for myself, and at about the age of 10, Mom wisely sent me to Frankel’s Fabrics in Garden City to learn to sew. I chose a shift dress pattern with a sailor collar, making the dress itself from old polka dot curtains, and cut the collar from a many-times-bleached white cotton pillow case, trimmed with rick-rack. Kind of a crazy quilt of a dress, but I was determined to save money, so there it was. Anyway, the class provided me with all the basic skills, supplemented by Mom, and I was off and running. I made culottes from the new-fangled spongey-backed fabric called bonded knit (which dissolved if nail polish remover touched it! ), embroidered peasant blouses, designed shorts and shirt ensembles, matched plaids for dresses with big, balloony sleeves, hand-smocked the wide cummerbund of a billowy crepe dress. Twiggy and Vogue magazine were an inspiration, and Carnaby Street style filled my closet. I even accepted the challenge of making a swimsuit (and it actually turned out OK, although I tended to wear it more as a halter-top body suit – yes! remember body suits?!). One particular project, though, almost proved to be my downfall. I’d been invited to attend a Christmas party with my older brother Steve, and his very cool friends – I was 16, they were 18 – and I wanted to have just the right dress to wear. So I spent hours combing through the pattern books – like now, I didn’t have anything specific in mind, just figured I’d know it when I saw it. I turned a page, and there it was – the dreamiest creation, exactly what I wanted. It was a (very trendy) midi-dress with a sweetheart neckline, princess seaming, flowing skirt, and puffy sleeves ending in multi-tucked cuffs, dripping with with 1930’s sophistication and Gunny Sax romance. Roaming the shops of the garment district in the city, I discovered a bolt of claret-hued silk velvet – pillowy, soft and shimmering, with a drape to die for – and just perfect for my dress! For the next couple of days I busied myself with layout, cutting and sewing, barely taking time for anything else. And then it was time to put in the zipper. Zippers? Bah! No problem! I’d done dozens by that point. So I threw myself into the task, knowing that I was nearing the end of the project. Oh yes, victory was soon to be mine, and I would be the toast of the party! At that point in my life, I was less interested in the journey, and much more excited about the destination. In other words, I was not so interested in sewing as an art in itself, and more in just wearing the damn clothes. So I blithely ignored my mothers tsk-ing and her advice to pin, then hand-baste darts, seams, etc, and routinely sped through projects just holding the fabric together with my fingers as I fed it quickly through the machine. So far, I’d gotten away with it. Back to the event that nearly became my Waterloo. I actually did pin the zipper in, and whipped through the sewing, clipped the threads, and lifted the back of the dress up before me so I could admire my handiwork. What the…?? I had sewn the zipper in upside-down!! After I cooled down (and realized that I’d never wear the dress to the party if I didn’t get over this), I crept back downstairs, offered an apology to Mom, and sat back down in front of the evil machine. Using a seam ripper and cursing under my breath, I carefully picked out each tiny stitch, and then hand-sewed the zipper in correctly. Yes, I finished the frock in time, went to the party, and felt smashing in my dress. Lesson learned – to some extent. I never sewed a garment again without at least pinning all the seams. Fast forward through many more handmade outfits for myself, and a few for the boys, and then many, many years where, except for occasional repairs and minor alterations, my sewing machine never saw the light of day. 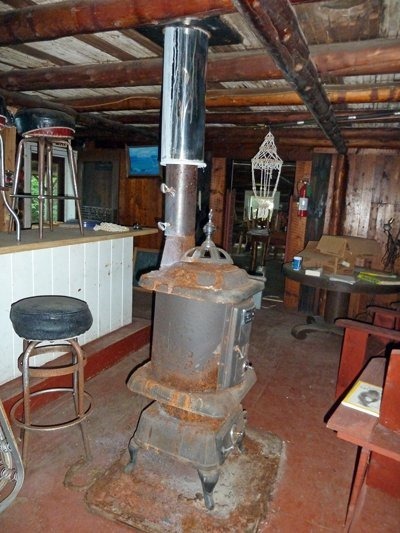 Then when I hauled it out of retirement one day, my 30-year-old all-metal, heavy-as-an-anvil, college-graduation-present Kenmore that I’d literally dragged all over the country with me, bit the dust. Using some of the money left me by my father, I treated myself to a beautiful Janome machine (I’ll always think of Da when I use it, and I don’t think he’d mind if I curse occasionally!). Inspired by some beautiful 60-year-old fabric that my mom found in a closet (my grandmother had used it to make curtains for my parents’ new house in 1953), my first projects with the new machine were a Vera Bradley-style purse for Mom, and organizer/overnight bags for my sisters and me. Instead of laying out and cutting the pattern pieces in an hour as had been my habit, I let that task drift over a few days (OK, I admit that that’s always been my least favorite part of sewing, so part of that was procrastination!). I took my time measuring, altering the pattern, hand-sewing tailor’s tacks, and other preliminary tasks, and just last night, finally sat down at the machine to begin putting the dress together. Pinning, sewing, trimming threads and excess fabric, slowly and carefully pressing open the seams. Suddenly and belatedly, I realized just how contemplative and relaxing an activity sewing can be. I feel like I’ve come full-circle, joining up with my mom, grandmother and great-grandmother in an exercise that I now know brought them not only pride in a job well done, but an opportunity for enjoyment, diversion, and meditation during their normally harried days. My niece Maeve is currently interested in learning how to sew, and I hope I manage to pass on not only the skills, but an appreciation for the tradition and the work that many generations of women – and some men! – have brought to sewing. PS: For anyone who might think that I’m just making up memories of some of my outfits, there’s no artistic license taken there. I could actually describe to you, in exhaustive detail, things that I wore even back to my first day of kindergarten! Believe it or not, I’m not at all what you’d call a clothes horse (and many of those years were spent in Catholic school uniforms), but I have a weird memory for details. My sister Pegeen thinks this is wildly funny, and one birthday years ago, she presented me with a wonderful little book that has since become a Broadway show. “Love, Loss, and What I Wore” is the title – I haven’t seen the show (I’d love to! ), but I highly recommend the book. Even if you don’t have quite the memory of clothes that I do, it’s a really fun little read! And one additional detail: When Mom didn’t wear her Grammie-made clothes anymore, they were cut up and re-purposed as other garments, and the buttons, belt buckles, and other special trims were saved in cans for the future. Some years ago, these were passed on to me, and so these special notions from the 1930’s – 1950’s have appeared on many of my own clothes over the years, and are still going strong! 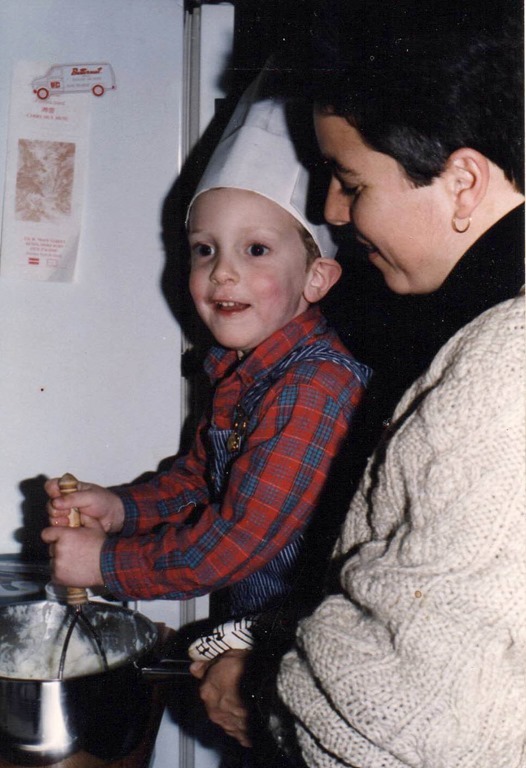 I learned to cook from my mom, who learned from her mom (and I’m assuming that my grandmother learned from her mother, and on and on). Mom is a great cook – I figure that in her lifetime so far, she’s probably made somewhere on the order of 50-60,000 meals, and kept several generations happy and well-fed. When my nieces were younger, they were so impressed with some of her culinary efforts that they suggested she market them: Grandma’s Good Gravy (always delicious, never lumpy), and Mom’s Macaroni and Cheese. The girls were right – both those dishes, and lots of others, beat the hell out of anything you’ll ever find on any supermarket shelf. 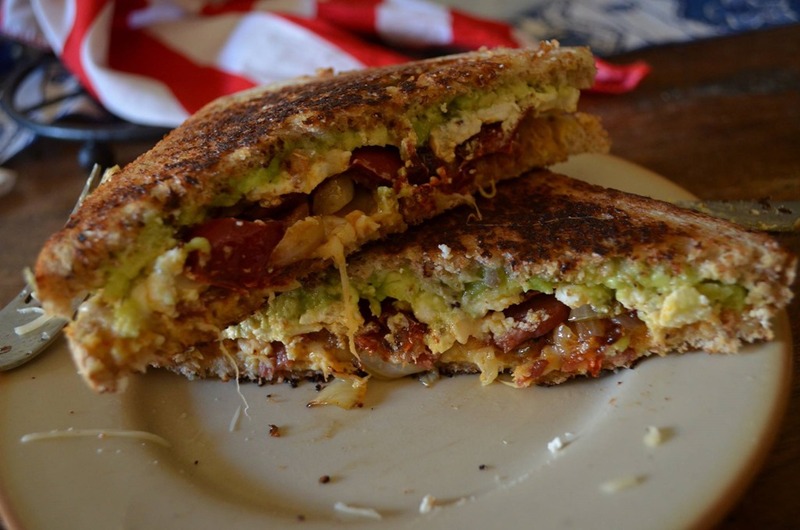 If you have access to an old family recipe box, you are lucky indeed. They’re becoming outmoded, what with the ease of picking a recipe off the internet, but these little boxes are real treasure troves. Not only can you see what your family feasted on over the years (yes, this might even include an orange Jello mold with grated carrots, pineapple, and miniature marshmallows, a staple on Grammie’s Thanksgiving table), but you’ll probably see it written in the cook’s own handwriting, sometimes with additional notes or old newspaper clippings. And you can tell from the grease stains on some of the cards which recipes were the old favorites, used over and over. For those who would quibble with my use of the word “man” instead of “person”, that’s totally purposeful – it’s just as useful and important for guys to learn to cook as it is for girls! 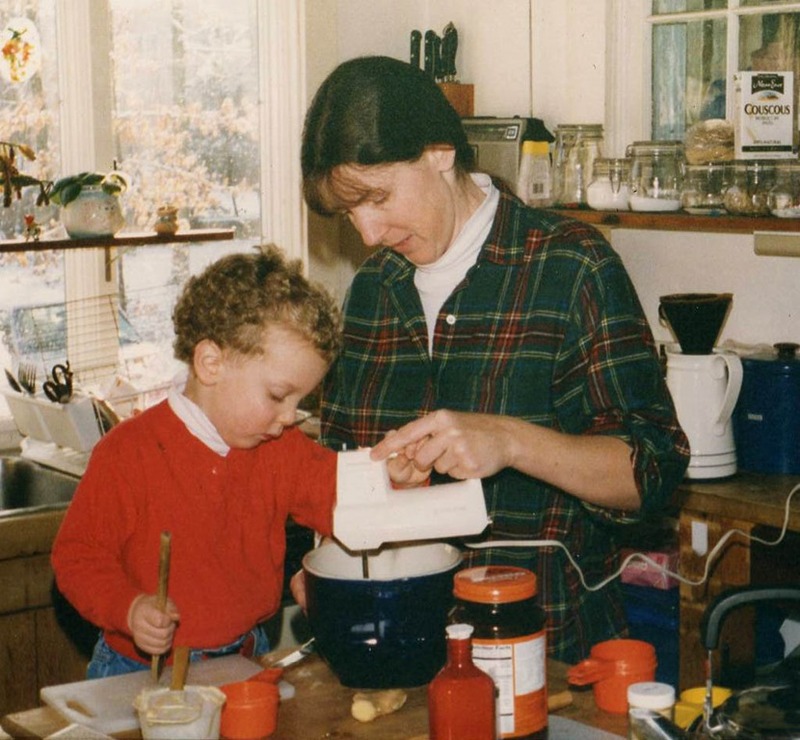 I’ve insisted that my sons accompany me in the kitchen many times over the years, showing them not only how to do simple things like bacon and eggs, but also heartier fare, including spaghetti sauce, soups and stews, as well as treats like breads, cakes and pies. The Angler with Kim, learning techniques from the pro. The boys might have grumbled at times (they actually thought it was a lot of fun when they were young) , but this exposure has paid off handsomely for Rockstar, who is currently studying in the south of France, living in an apartment on his own. A well-stocked outdoor market is a few steps from his door, and he ventures out to pick up some of the best meat and vegetables to be found on the planet, then brings them back home and starts experimenting. He’s posted photos of some really luscious-looking concoctions, all of which inspire his fellow students to beg him for invitations to dinner. Since these questions always seem as if the writer is drooling on the keyboard, I asked him what his friends generally eat. The answer? The French equivalent of fast food – a baguette with meat or cheese, mostly. And when some friends back home sent him a care package including a box of Kraft Macaroni and Cheese, it was apparent that his fellow students (the Americans, at least) could barely restrain themselves from knocking down his door! Poor kids. Think what gastronomic delicacies they could be consuming right now if they’d only learned to cook…. Go! Go now, and get out your knives, your pots and pans and cutting boards, and dig up that old recipe file. And if you don’t have one at hand, call your mom – she might even be willing to give you some lessons. Better late than never! First snow. OK, not really first snow – that was weeks ago, although it was just an inch, and was gone by the next day. Weather forecast says accumulations of five to eight inches possible. That’s the operative word, possible. I never believe the weather reports, just look out the window and wait. (Accu-Weather – now there’s an oxymoron for you.) Looks like the usual suspects are taking no chances, though. School was called off this morning, reminding me of snow days past, with the boys ecstatic at the prospect of gliding down Gaunt Park Hill, to be followed by cups of marshmallow-y hot chocolate. Even the library is closed for the day, although I had to walk up the steps before I realized. No cars out front, but there were several bicycles locked in the rack, which I attributed to folks more intrepid than I (admittedly, it’s no hazard for me to travel to the library, it being only half a block door to door – as the realtors say, location, location, location!). I love walking across town with the snow flying. It forces me to slow down, allows me to observe things I’m usually in too much of a hurry to notice. Homes lit cozily from within, frost tracing the lower corners of the windows, just like in children’s picture books. Scent of wood smoke in the air. Snowflakes stuck in my eyelashes and bangs, sneaking down my neck. Giggles of little tots as they lick snow from a porch railing that’s the same height as their mouths. I have great memories of winters gone by, blizzards that actually did keep us home from school (we rarely had snow days), whizzing down “Suicide Hill” on our Flexible Flyers. 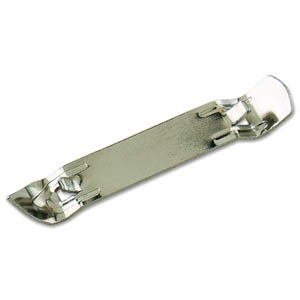 Plastic bread bags on our feet, making them sweat inside the old black galoshes with the clips running down the front (at least one of which always refused to close). We’d stay outside sledding, throwing snowballs, building snow forts, making snow angels, until our teeth were chattering, our lips blue, and mittens matted thickly with ice. Those were the days! I’m looking forward to some real white stuff coming to close the roads, pile up attractively on the fence posts, and keep us indoors, snug around the woodstove. Tonight I’ll spend an (anxious) evening waiting for the stomping of my son’s boots on the kitchen porch, telling me he’s off the slushy, icy roads and home safe. Ordinarily, when conservative columnist Michael Gerson puts pen to paper (or whatever the 21st century incarnation of that phrase is), I’m not so much inclined to share his opinion. But this past week, describing his feelings as his first-born went off to college, he had it spot-on. This is not the first time this realization is coming home to me; the Angler left for college four years ago, and even Rock Star has already completed a year away. But both times, it was just a two-and-a-half-hour drive, and Rock Star’s involvement with Wheels brought him home many weekends for gigs. I actually thought he needed to stay at school more! 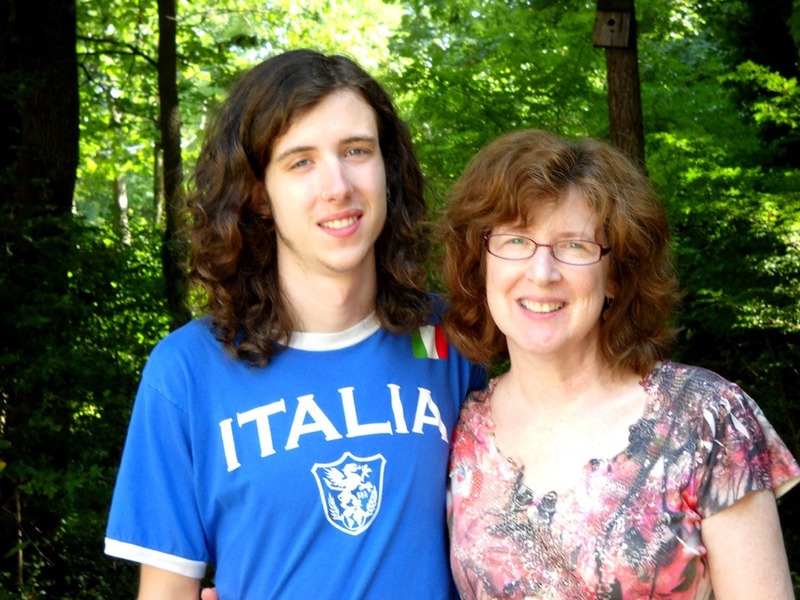 This time, though, it seems more momentous, for there will be no spur-of-the-moment visits back to the Old Homestead – RS is headed off to France, pour apprendre le français par immersion totale (for the uninitiated, “to study French by total immersion”). I’m feeling a whole constellation of emotions about this: sad because I’ll miss his company – yes, he’d be away most of the time anyway, but this is so far, and he won’t even be home for Christmas (yeah, yeah… boo-hoo, Mom); thrilled for him, because it will be such an adventure; and also envious! – who wouldn’t want to spend almost a year à l’université in the South of France?! Various friends are in a similar situation right now, seeing one child off to college for the first time, or even becoming empty nesters. I suspect that for most, things will even out relatively quickly. My brother told me that although he and his wife were in tears on the way home from dropping their youngest at a far-away dorm, by the time they arrived home, they were laughingly making plans to turn her bedroom into a spa (never happened, and as occurs often these days, she ended up back in that room again for quite a while!). Meanwhile, we’re all consoling each other with offers of company, coffee, wine, and the occasional crying towel. Lots of evocative songs are being passed around: two that I’ve shared are Lord Protect My Child (Dylan, but the version I like is sung by Susan Tedeschi) and Forever Young (Bob Dylan, the bard of our generation, gets it right yet again – this time with The Band, one of my favorite groups of all time – and the same for RS, coincidentally!). The Dixie Chicks’ Wide Open Spaces was put out there by a good friend. This last song reminded me so much of myself, running away from my Long Island roots to Vermont, Colorado, Wyoming and Montana – nothing seemed far enough away from my hackneyed and boring suburban existence. (And if it weren’t for my intended traveling companion’s parents stepping in at the last minute with the voice of reason, we would both have been in the Aleutian Islands, slaving away in a fish-canning factory!) I always needed new people, new places, exciting experiences, preferably with a backdrop of water, craggy mountains and primeval forests. The first time I left home, I loaded my backpack and fishing pole onto a Greyhound bus, eagerly and with hardly a backward glance, as my poor mom stood outside the window trying to put on a brave face – her girl was off to see the world (as she herself never had the chance to do up to that time). I know intellectually that this is exactly what we hope for – that our children will be independent and adventurous – we give them roots so that they can sprout wings. It’s the very intention of the Gibran poem that I’ve always loved to pass on to new parents: “…You are the bows from which your children as living arrows are sent forth….” Easy to say, when your children are still safely ensconced in the nest. I’m waiting for my heart to catch up with my mind. Jerry and I will go over to France next spring and have Rock Star show us around his neighborhood and wow us with his language skills. Meanwhile, back at the ranch, I’ll occupy myself with bringing my own French back up to speed and beyond (la dialogue normale is always a challenge). And through it all, I’ll remind myself that je ne regrette rien! 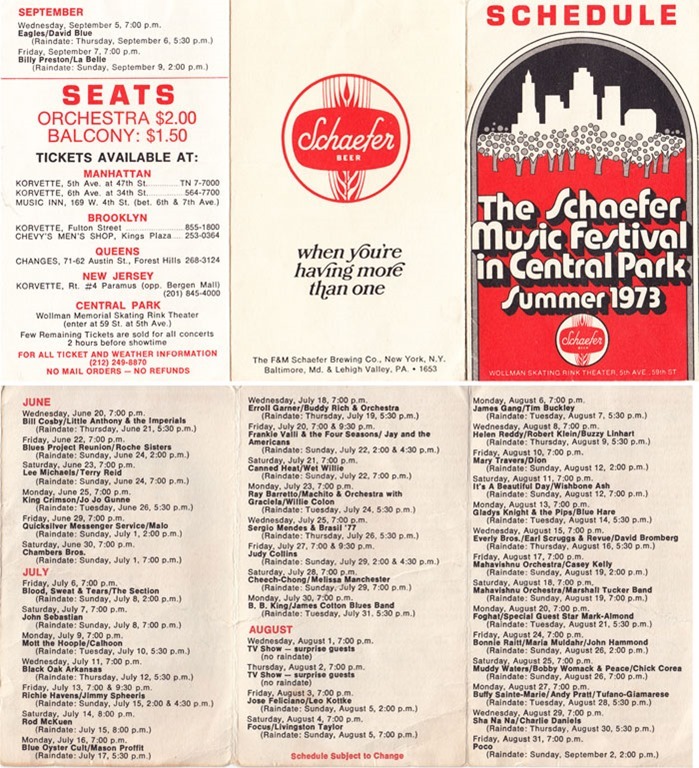 Spending my childhood on Long Island in the late fifties and early sixties was a treat in lots of ways (although somehow I probably didn’t appreciate it as much then as I do now), not least in the number and variety in my neighborhood of what we called “Candy Stores” – there were 3 within a 5-minute walk of my house, and I alternated among them, although Bert & Edie’s was the one I visited most often. When you walked into Bert & Edie’s the first thing you passed was the tall, glass-fronted tobacco counter, behind which were arrayed all the brands of cigarettes whose names we sometimes appropriated for street games (“I declare war on… Chesterfield!”), as well as cigars in wood and cardboard boxes, pipes, bags of loose tobacco, pipe cleaners, and other smoking accoutrements. On a platform in front of the tobacco stash were all the daily newspapers, which, aside from the comics, I had no interest in. Right after the tobacco came the object of my affection – the candy counter. It was a tall, wooden case, subdivided into what seemed like hundreds of sections by little glass panels, holding an amount and variety of candy that would make your head swim. The nickel (or quarter, if it was Sunday) I held protected in my fist would get all sweaty during the time it took me to make a decision, my eyes darting from one candy bar to another, mouth watering in anticipation. Edie, in her apron with its pocketful of coins, always waited patiently while I took as much time as the signing of the Dayton Peace Accords (or so it must have seemed). 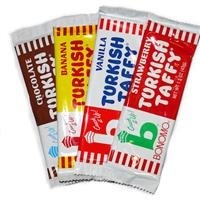 Some of my most favorite treats: Bonomo’s Turkish Taffy (B-O-N-O-M-O — O-O-O it’s Bonomo ♫) – put it in the fridge till it got cold, then smash it on the sidewalk or against the side of the house! (Boy, does that sound weird if you’re not familiar with the ritual – “Oh, I buy a candy bar and smash it against the side of the house – that satisfies my sweet tooth….”) Sugar Daddy or Black Cows could pull your fillings out when they got small enough to chew, but were sweet and satisfying. Jujubes – tiny, colored cylinders – if you just sucked on them, they’d last forever. Reams of penny candy, especially Bazooka Bubble Gum, licorice whips, B-B-Bats taffy lollipops, and regiments of pastel-colored candy dots marching down long strips of paper. I guess you can see where this is going… I usually bought sweets that would take a looong time to finish – that way, I felt like I was getting a lot more out of my nickel. A few other things I really liked, but that didn’t seem quite so practical, were those candy necklaces on elastic, that would leave sticky, pastel stripes on your neck; wax lips – lots of fun to play with, and tasted good – at least until the sweetness dissipated, and you were left with a big ball of paraffin in your mouth – ick; bubble gum cigars – had a similar fate to the wax lips, especially since I usually ended up breaking off fresh pieces of the cigar and adding them to the wad in my mouth as soon as whatever was already there lost its flavor; Pixie Stix – straws of sour, fruit-flavored powder (maybe a forerunner of Pop Rocks) that would make you choke and cough if you poured them into your mouth too fast. A couple of other items that I had to try because they looked sort of enticing, were disappointing – Chuckles, the rainbow of sugar-coated jellies – bleccchhh; Boston Baked Beans – what the heck were those things, anyway? ; and the biggest disappointment of all, the little wax “Coke” bottles filled with about a half teaspoon of colored sugar syrup – what a rip-off! I loved lots of other candy, including Licorice Nibs, Good & Plenty (I was a big licorice fan! ), Chocolate Babies – these were extremely un-PC, but they tasted good – I had a standard operating procedure for eating them, sort of like chocolate bunnies – I always started with the feet, because I felt bad about biting their heads off; Smarties, Jawbreakers (not the dentist’s favorite) and SweeTarts; Goldenberg’s Peanut Chews (my passion as an adult, too! 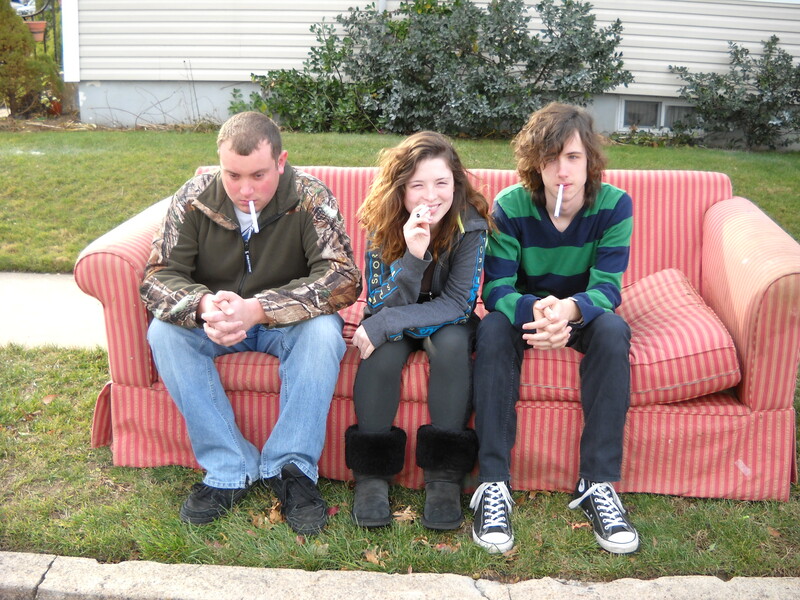 ), Chunky, Frozen Milky Way, Oh Henry, and of course, M&M’s; Candy Cigarettes (which figure prominently, along with discarded couches found at the curb, in a series of photos of my kids as they grew up); the more adult taste of Royal Crown Sours (I wish you could still get them!). Bit-o-Honey, Mary Janes (but not those orange and black wrapped taffies people threw in your bag at Halloween), Now-and-Later. Fruit Striped Gum and Juicy Fruit (which took on a whole new life after the movie One Flew Over the Cuckoo’s Nest), and the packets of mini-Chiclets were my go-to chewing gums. 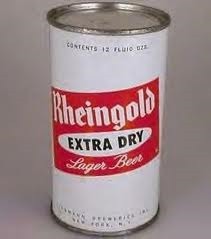 I loved malted milk balls, hated root beer barrels. And Charms made the best cherry lollypops. Gee – reading this makes me realize that there must have been thousands of different kinds of candy! Mmmm… so much candy, so little time (and money!). 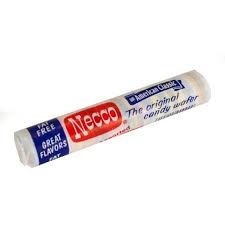 As a Catholic child, one particular brand of candy figured prominently in my religious life, such as it was, before my First Communion: Necco Wafers. We’d stash them in our pocketbooks, and when the adults went up to receive Communion, we’d unwrap the waxed paper, and solemnly place wafers on each other’s tongues. I think this was a major reason for a minor letdown when I was old enough to receive myself – the cardboard-y, unleavened host was certainly no taste match for a Necco wafer! 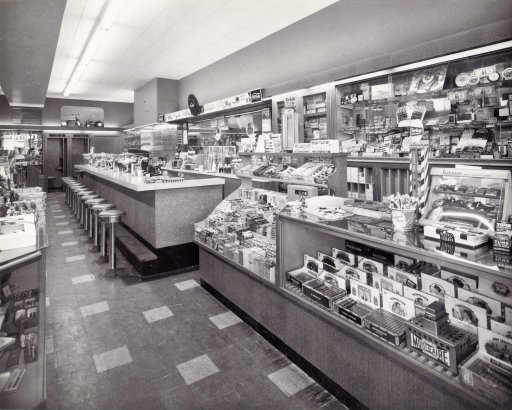 Although it’s not candy-related, the one other major attraction of the candy store for me was the lunch counter, where you could sit yourself on a stool (and spin around a few times while waiting for your order), and have a soda – sometimes a Coke or 7-Up, but most often the quintessential and confusingly-named egg cream. 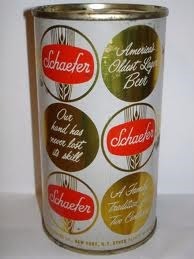 At a dime a glass, it was one of the most satisfying treats to be had. As a grownup, and especially living in a part of the country far from the Big Apple and its exceptional culinary pleasures, I’ve often been asked about this delicious concoction, and where it gets its name. I haven’t been able to discover the origin of the name (there are lots of apocryphal stories), but you don’t need to know that information in order to be able to enjoy one yourself! 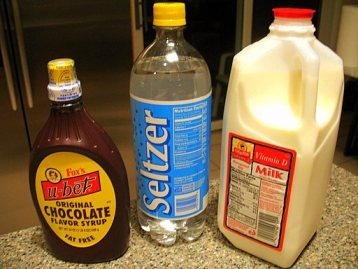 Take a large glass (the bigger the better, as far as I’m concerned), and pour in 1/4 to 1/2 cup of milk or half-and-half, then about 1/4 cup of Fox’s U-Bet chocolate syrup (for those who don’t have a source of Fox’s, Hershey’s will suffice! ), and stir like mad until the syrup is completely incorporated – the amounts may vary according to the size of your glass, as well as your taste, but I can think of much worse things to experiment with! Then carefully fill the glass with chilled seltzer, stirring gently all the while. 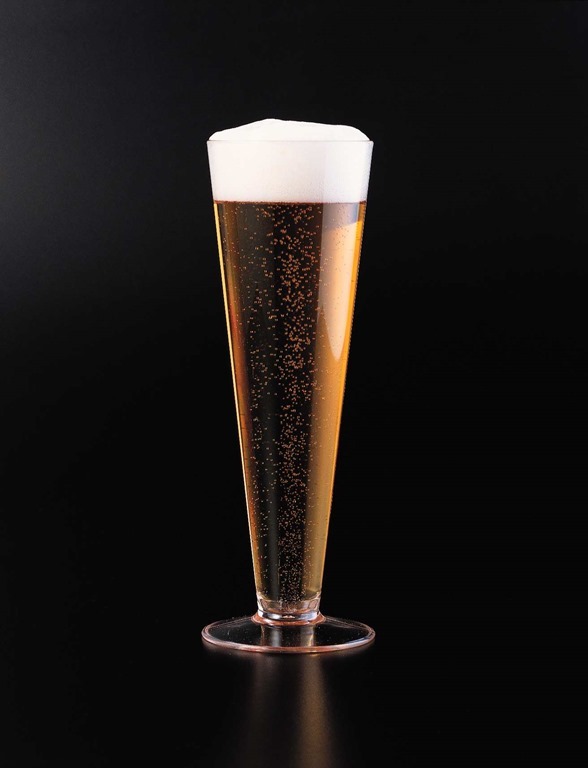 You need to go slowly, and sometimes wait a bit for all the bubbles to dissipate, but it’s worth the wait. Now pop in a straw, and enjoy!